Root tip resection is a dental surgery procedure that allows the patient to keep the tooth concerned, even though the treated tooth will not endure as much load as a healthy one. Chronic inflammation around the root tip. The tooth root channel is blocked, so root filling cannot reach the tip. A cyst forms around the root tip, and it is not expected to regress. In case of (suspected) focal infection; a tooth with a root filling is considered an infection focus even if there is no inflammation around it. Root tip resection is usually performed under local anaesthesia. It involves opening a small “window” on the jaw bone, through which the inflamed tissue and the root tip are removed. 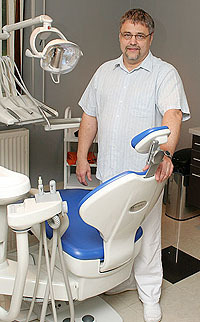 Before or during the operation (depending on the case at hand), root treatment is also performed, i.e. the root channel is cleaned and a filling is inserted. In case of inflammation, removing the root tip is necessary because the bacteria in the branching root channels would otherwise restart the infection. The wisdom tooth cannot break through the gum for some reason. Bacteria proliferate and cause inflammation underneath the gum lobe that covers a partially emerged wisdom tooth. The tooth breaks through in the wrong direction. A wisdom tooth that breaks through the gum in the wrong direction damages the neighbouring tooth. A wisdom tooth is removed under local anaesthesia, usually in the same manner as any other bad tooth. However, it is possible that the tooth can only be extracted in several pieces; suturing the wound may also be necessary. Do not eat or drink during the effect of the local anaesthesia.